"Precocial" chicks are up and away! The most distinctive characteristic of the California Quail is the black, forward-facing topknot that juts out from its forehead like a small flag. 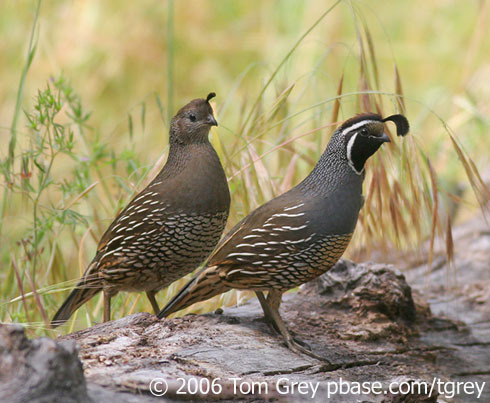 The California Quail – the state bird of California – builds its nest right on the ground. Almost immediately after hatching, the precocial chicks are up and running, following their parents to feed. Find your local Audubon, take a field trip, and maybe see a quail! Does this bird seem to be saying “cha-CA-go, cha-CA-go”? Don’t be misled—this small ground-bird, the California Quail, is strictly a bird of the far west. The California Quail’s gray and rusty-colored body is beautifully adorned. And the most distinctive characteristic of this quail is a black, forward-facing topknot that juts out from the bird’s forehead, like a small flag. Although quail can fly short distances, they spend most of their time on the ground foraging for food. When they’re threatened, they scurry into thick brush. Quail build their well-concealed nests right on the ground, which can hold from one to twenty-four eggs. Twenty four?! Yes, the large clutches may include eggs from more than one female. Immediately after hatching, the chicks follow their parents around the neighborhood, scratching for food. Two or more quail families may join together to form a covey of quail. With such a large extended family, it’s not surprising when a male California Quail hops up on a stump to gather the covey together with this rallying call. BirdNote encourages you to learn more about your local Audubon chapter. Begin with a visit to our website, BirdNote.org. I’m Mary McCann. Bird sounds provided by The Macaulay Library at the Cornell Lab of Ornithology, Ithaca, New York. Recorded by D.G. Allen.